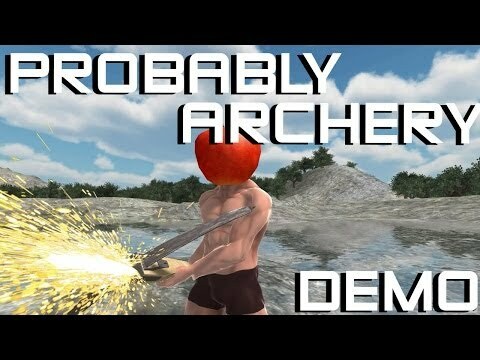 We've just finished up the demo of the full version of what started as our 7DFPS game jam game, Probably Archery. Inspired by games like QWOP and Surgeon Simulator, you have control of the shoulder, elbow and wrist joints of your left and right arms and you must overcome a series of ridiculous challenges ranging from shooting a hangman's rope to stopping an apple-headed warrior in space. Our 7DFPS game was surprisingly popular, showing up on the front page of Reddit and in over 100 videos on Youtube. It seemed obvious that we needed to expand the game and make a full version and I had to add Oculus Rift support. I'm going to keep expanding on the Rift support as time goes on. We've got a multi-camera setup where the arms, bows, etc is drawn separately to the rest of the scene for reasons like shadow quality so that's made the implementation a little trickier. I have been working on super sampling support which does make a huge difference to quality, but I'm holding off on including it until I have it running faster with it enabled as a good frame rate is more important. I'm happy to discuss the implementation and the different methods I've developed to allow super sampling in Unity without the limitations on rendering mode or shadows. I'm also looking into rendering onto a pre-distorted mesh rather than using the post processing effect for the barrel distortion and what benefits that might give. If the game is greenlit on Steam then we'll be able to finish the full version which will have more levels, multiplayer modes, leaderboards and more Oculus Rift options so if you're interested please vote for the game. Awesome! Rift version worked well. Being able to aim and then tilt your head a little to see the target better was nice. Voted on Greenlight. Thanks. One of the unexpected but cool things I found after implementing the Rift besides the head tilt was the idea of closing one eye to look down the arrow shaft better if one eye is lined up with the arrow and the other isn't. It's a little thing, but it added a lot to the immersion knowing it mimicked reality in that way. Just tried to play it, but found that as soon as I'd made any adjustment to the hand holding the bow, it just wouldn't let me nock an arrow. If I reset, it worked, but again as soon as any adjustment is made to the left hand, it didn't work (and I'm assuming you have to adjust that hand so you can put an arrow in straight?). It can be a bit tricky to understand at first which is kind of the point, but we'll probably need to include a tutorial in the final version. 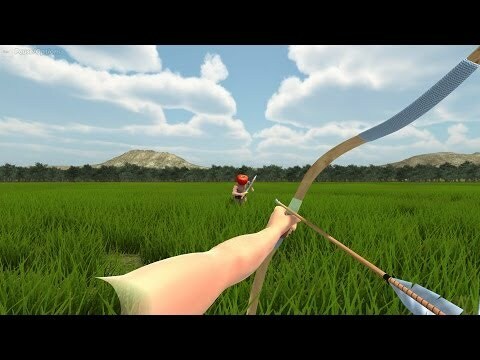 You can move both arms and need to get the arrow near the bow string before you can nock it (right mouse button or left trigger). I'll do a video tutorial soon, but you can watch someone playing it on Youtube to see how it works. I'll post the latest video someone's made below. Let me know if you still have problems or if it's actually a bug you've found. Doing battle with the controls is half the sadistic fun of the game, but they will 'click' before too long. I would love to use Hydras with this game ...is that possible? Not yet, but that's high on the list of things I'd like to add to the full version. I don't have a Hydra at the moment, but I'm about to order one. It would be a very different game using the Hydra since the controls are a big part of it. Using a Hydra you'd be directly moving the hands and other joints would have to be controlled by IK so I imagine it will be a lot easier and I it wouldn't be fair to allow them in multiplayer (unless it was a Hydra only server). This is a lot of fun. Aiming in the rift actually feels a lot better because of the dual cameras, so your hands don't block your view as much. Of course I'm still absolutely useless at hitting anything but that's part of the fun. Great job! Voted on greenlight. Also, oh my god those intro cutscenes do not translate well to the rift. The "Don't Miss" one especially was an insta-dizzy for me when it force-pans to the ground. Woah.. this works in Linux - without any further tinkering (after the initial Rift setup). I think that's the only one that does (on my installation, anyway). I'm not 100% sure if the "warping" (not sure that's the right word) is correct, as there aren't any straight lines close enough to judge from - but it feels right, and the game is fun. Thanks for including Linux! I wish more people did. Thanks mate . I'd tell people to go check out Lunar Flight in the Rift, but I'm pretty sure I'd be preaching to the choir . It's fair to say that sitting at your desk and sliding the Rift down my unsuspecting face the first time and seeing the cockpit in Lunar Flight is the reason I have one sitting on my desk now. Thanks a lot. Yeah I was really happy with how it looked in the Rift, the depth perception really is a positive factor in aiming. One of things I love to do most in the current version is wait for the guy in the Space level to get fairly close and then shoot him in the apple. Watching the apple chunks float past and his body slowly moving around looks so cool in the Rift. The cutscenes were my biggest worry for the Rift version, but I was surprised that for the most part they didn't affect me negatively at all, but it doesn't surprise me that they might for some others. That particular shot in "Don't Miss" is one in particular that I might look at modifying in a later version . Awesome, glad to hear it worked for you. I must admit I was very happy to read this because just a few minutes before you posted this I realised I hadn't recently re-tested the Rift mode on Linux and was worried that it mightn't even work at all in the current version. This game is super fun, but the cutscenes make me very nauseous so I can't play for very long. It'd be nice if there was a skip cutscene button, instead of fast-forward... that just makes me sicker I usually just close my eyes and check if it's over, which makes the noose level even more near impossible because of the time I lose. Also, does anyone else feel like the menu is too close to your face? Other than that I totally love it.